When learning how to make recipe cheesecake bars, the variety is endless. Because of the enormous list of ingredients so suitable in these is why we have so many wonderful recipes. You might prefer fruit topped bars, creamy spice bars or fudgy brownies with cream cheese. Your favorite recipe cheesecake bars can be varied from time to time. Perhaps you would like to stir in some morsels like chopped candy mint wafers, chocolate toffee crunch or milk chocolate raisins. Perhaps you might dress up the bars by topping them with fruit flavored gum drops, colorful M & Ms or pastel colored miniature mints. 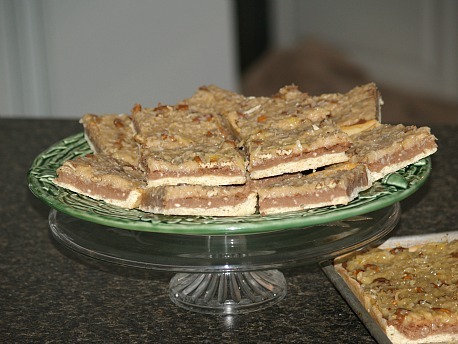 When you learn how to make recipe cheesecake bars you will know that by changing the nuts in the recipe, the flavor and texture also can be changed. Try some cinnamon roasted nuts or honey roasted nuts; both are delicious. Of course your fruit bars are easily changed simply by changing the type of fruit. Mix and match the ingredients in your favorite recipe cheesecake bars for exciting new results. Recipes for cheesecake bars vary from cheesecake recipes in that they have a texture more like a cake and for this reason they make great finger food for parties. You could not take your favorite ricotta, cottage or cream cheese cheesecake recipes and merely pour into a pan they would not turn out properly. Learn how to make recipe cheesecake bars and find your favorite! Combine and mix butter, flour and ¼ cup brown sugar; press evenly in ungreased 8 inch square pan. Combine cream cheese, 1/3 cup brown sugar, milk, vanilla and egg; beat until blended. Spread mixture over baked crust; sprinkle with pecans. Bake 25 minutes or until edges are light brown; cool. Cover and refrigerate at least 2 hours; cut into bars. The tangy lemon taste blend perfectly with cream cheese to make this recipe for cheesecake bars very popular. Combine dry cake mix, softened butter and egg in a large mixing bowl; beat on medium until blended. Stir in pecans; press evenly on bottom of ungreased 9 X 13 inch baking pan. Bake 10 to 15 minutes or until set; cool completely. Beat cream cheese, sugar, peel and juice until smooth; spread over baked layer. Beat dry pudding mix with milk about 2 minutes until thickened; pour over cheese mixture. Refrigerate about 1 hour; cut into bars. Everyone loves chocolate and peanut butter in a recipe cheesecake bars. Great combination! Stir together the crumbs and butter; press into bottom of 9 inch square baking pan. Beat cream cheese, peanut butter and sugar on medium speed until well blended; spread over crust. Melt chocolate chips with shortening in saucepan over low heat; stir until smooth. Drizzle chocolate over cream cheese mixture; chill 6 hours and cut into bars. This recipe cheesecake bars is a little different from most; it has a yeast crust which is delicious. Dissolve yeast in warm water in large bowl; stir in 1 cup flour, ¼ cup sugar, salt, 1 egg and butter. Mix batter vigorously until smooth; add enough of remaining flour to make dough easy to handle. Turn dough out onto lightly floured board; knead until smooth and elastic. Cover and let stand 20 minutes. Press dough in bottom and up sides of pan. Beat cream cheese in a large bowl on medium speed; gradually beat in the sugar and cocoa until fluffy. Beat in 3 eggs one at a time and the vanilla; scrape bowl occasionally. Pour into crust in pan; bake about 25 minutes or until crust is brown and center is set; cool completely. Spread top with coconut pecan topping (recipe below); refrigerate until well chilled. Cut in 2 inch bars and refrigerate leftovers. Heat sugar, butter, milk and eggs in saucepan over medium low heat stirring constantly. Cook about 12 minutes or until thick; stir in remaining ingredients. The chocolate and strawberry combination make this recipe cheesecake bars a favorite. Preheat oven to 375F degrees; grease 9 X 13 inch baking pan. Combine and mix butter, ½ cup sugar and egg yolks in medium bowl. Stir in flour and press evenly in prepared pan; bake 18 to 20 minutes or until golden brown. Immediately sprinkle hot crust with 1 cup chocolate chips; let stand until chips are softened. Carefully spread softened chocolate chips out over baked crust; refrigerate until chocolate is firm. Beat cream cheese on medium speed until smooth; beat in ¾ cup sugar, vanilla and 2 eggs. Stir ½ cup chocolate pieces into cream cheese mixture; pour over top of chocolate in pan. Bake 30 minutes or until filling is set; spread top with strawberry jam. Refrigerate at least 3 hours; cut into bars.